ESWN has a story about “the Second WoW War,” where the First WoW War would be based about The Most Famous Pervert In China. It is, in short, a tale about a virgin maiden and her seduction at the hands of a powerful WoW guildmaster. The tale is told by the maiden’s elder brother on Tianya Club forum. Facts of the tragic story surrounding the implied call to war were examined, and doubts were cast on certain details. Netizens remained guarded and wary. Then it was revealed that the male WoW seducer in question belonged to a guild that had just climbed its way to #1, and that the post (containing the sordid seduction story) was suspiciously posted right after this annoucement. Could jealous WoW players be overturning the Chinese flash mob phenomenon for unjust and untrue ends? Virtual China has an interesting article about an incident in China’s World of Warcraft. 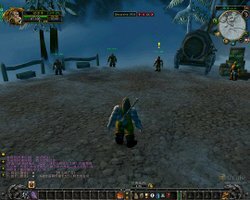 The short version, details are in two articles at EastSouthWestNorth: The Most Famous Pervert in China and The Second WoW War. This is soooooo hilarious regarding the gaming world but so sad for the girl. I’m not sure if I should laugh or cry. Hey, just recommend you a wonderful site to get know Chinese companies, where you can find more than 10 million corps. http://www.duseek.com ,here it is, welcome.